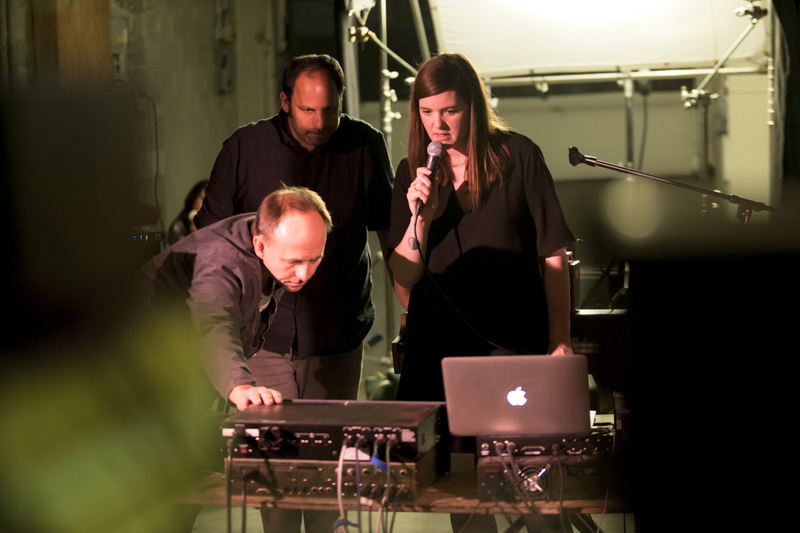 For this first edition of Deciphered, we invited internationally acclaimed composer, producer, and performer Julianna Barwick to our space to explore and create original music on a custom-designed effects rig. Julianna is known for her beautiful atmospheric multi-layered vocals, so we built a setup to complement that sound, focusing on lush, dark, and vibey vintage reverb effects from our gear collection. After learning the ins and outs of the gear, Julianna improvised and crafted several new pieces of work. The music was all created live without any overdubs, edits, or backing tracks. The sounds were rich, warm, and lush, and our crew was left in awe. Our goal was to give Julianna a fun and easy way to explore different reverb textures. 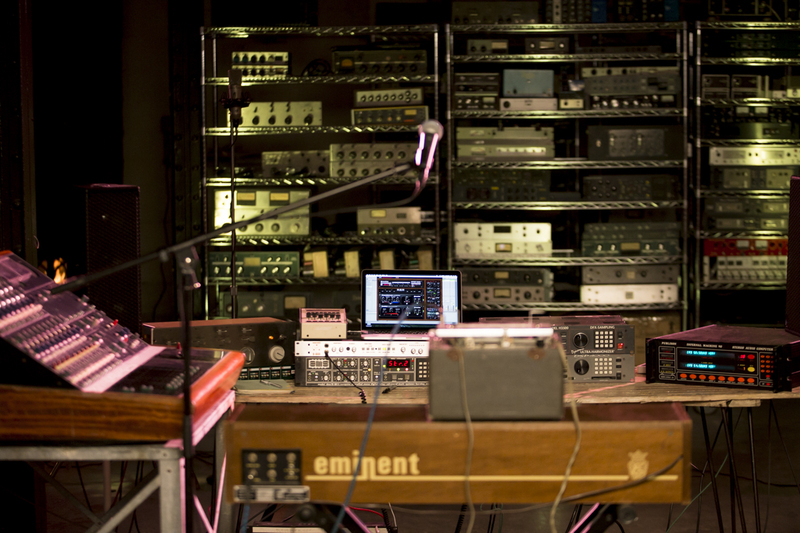 We built her setup around a vintage Neve BCM10 10-channel mixing console, a vocal mic and a vintage analog string synth. 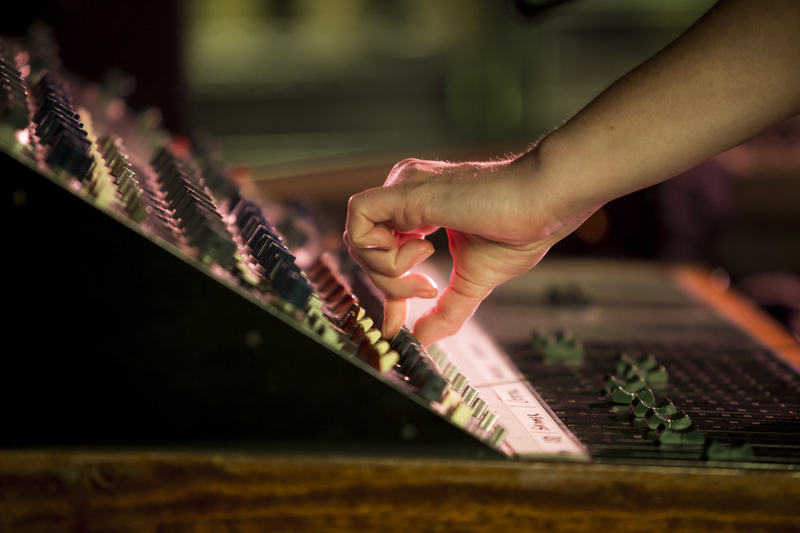 One effect send was split out to four different effect chains, each returning to a different pair of faders, and a second send drove the six hundred pound EMT 140 plate reverb which was patched to the Neve’s echo return input. The result was a massive effects mixer, with total control of the blend of the various spatial effects at Julianna’s fingertips. The vocal mic was patched directly into the Neve BCM10 channel 1 mic input. A simple and unique-sounding analog string synthesizer made by Eminent in Italy in the 1970s and distributed by ARP, This was patched into a Maestro EP-2 tape echo, an Electro-Harmonix Freeze pedal, and a Radial DI patched into channel 2 of the BCM10. Julianna’s favorite piece, the heavyweight reverb champ and studio staple EMT 140 from Germany. This is one of five EMT 140s in our collection, and its sound is dense, rich, dark and beautiful. Perfection. An early vintage Lexicon 224 digital reverb and the classic AMS DMX 15-80 delay / pitch-shifter were used to recreate the “shimmer” effect made famous by Brian Eno and Daniel Lanois, with the AMS creating an octave up effect, the Lexicon adding a dark warm chorused reverb together with the Neve BCM10 creating an effect send/return feedback loop. A pair of Eventide Harmonizers were used in this chain, with the H3500 running a “Crystal Echoes” patch, and the DSP4000 running a “Black Hole” patch. 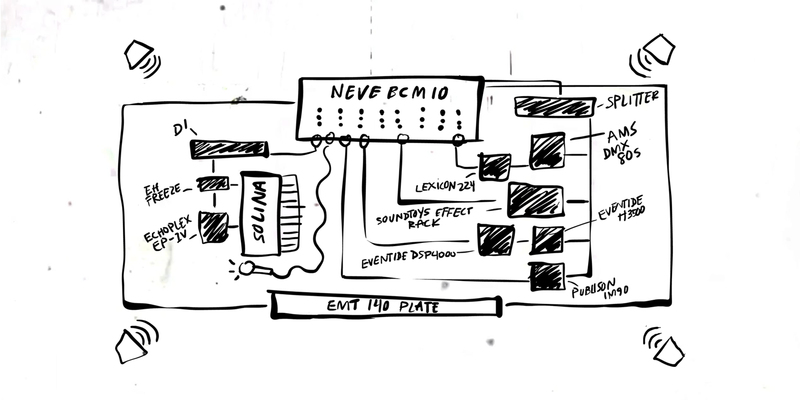 Soundtoys founder Ken Bogdanowicz, and engineer Robert Belcher were the main designers for these effect boxes during their time at Eventide. We used this rare old quirky and expensive piece of gear from France for its “Sound Hoarder” program, which is a type of reverb with infinite decay, and can “Hoard” any sound that goes into it for minutes, or maybe even hours (if it could stay running for that long). The only plug-in in the session was our Soundtoys Effect Rack running a patch that we created especially for Julianna, a lush pulsing panning spatial effect based on our “Boards of Vermont” patch. Deciphered: Artists In Residence is a brand new series designed to make our classic gear collection, our team of engineers and gear-heads, and the creative workshops at our Burlington, Vermont headquarters available to adventurous artists with unique perspectives on sound, creativity, and technology. For more info about Julianna Barwick, please visit http://www.juliannabarwick.com/.